Here at Breadnbeyond, we often work together with skilled voice actors from around the world to do the voiceovers for our explainer videos. After countless email chains and Skype calls, we’ve learned one thing from them: voice acting is a damn difficult skill to learn. Because of this, we got interested in the art of voice acting and what it takes to become professional voice actors like the people we work with. 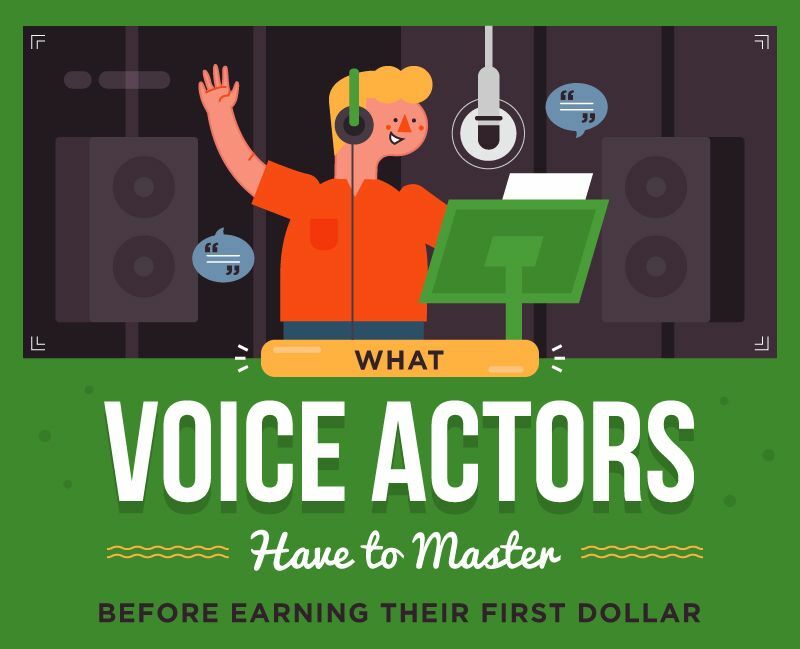 After gathering tips and tricks from our best voice actors, we’ve compiled the skills that you need to learn before you can earn your first dollar from a voice acting job into an infographic. How Much Do Voice Actors Make? Voice acting is a diverse field of profession, Hollywood-class voice actors like Dan Castellaneta from the popular series The Simpson has been rumored to earn $300,000 per episode of the series giving voice to the starring role of Homer Simpson. But it’s also been reported by the U.S Department of Labor that the average hourly wage for a voice actor is $17.50. Other shoulder occupations such as radio and TV announcers have been reported to earn an average annual salary of $35,360. You can decide to become a voice actor anytime you want, you have a voice after all. It’s earning the money from voice acting that’s difficult. Unless you’re a mumble rapper, then enunciation should be a good skill to have whether you’re a voice actor or not. However, enunciation is a particularly important skill for voice-professionals like voice actors, narrators, announcers, and public speakers. Mumbling annoys listeners, and people don’t want to hire your services as a voice actor if you annoy people. Nobody likes asking “what did you say?” more than once. In rare occasions, mumbled words can cause phrase mix-ups. For example, when you say goin’ and mean go in. On top of that, mumbling makes you look like you’re doubting your arguments – which reflects a lack of self-confidence and is not sought after by brands and employers. Speaking too fast can make what you’re saying appear salesy, as though you’re trying to sell something. When instead you should be imparting expertise on a subject matter while being persuasive. For example, in a promotional piece like an explainer video, the ideal pace is between words per minute – and not any faster. We’ve compiled more skills that you need to land your first voice acting job in an infographic you’ll find below. You can share this infographic to your blog posts by using the embed code at the bottom of this page.